NFL superstar Julian Edelman took it all off after talk show host Ellen DeGeneres made him an offer he couldn’t resist: $10,000 donated to the Boys & Girls Club of Boston if he let her shave his epic beard. Not only did the Super Bowl MVP graciously accept the deal, he one-upped her with an offer of his own—to match the donation in full. “This is like nine months of hard work,” Edelman pleaded as DeGeneres broke out the razor. “I love you, beard. It’s been a hell of a year,” Edelman remarked. By her own admission, DeGeneres is not an experienced barber. Thus, the end result was patchy, uneven, and unsightly. Nevertheless, it was hilarious. 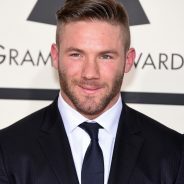 “I look like a different person!” Edelman exclaimed. “You’re very handsome under all that stuff,” Ellen commented. Edelman’s good-spirited nature shows that he not only has a big heart for football, but a big heart for the community as well. According to Good Celebrity, Edelman has a long history of supporting good causes. In December 2017, the wide receiver hosted a public reading of his children’s book, Flying High, in an effort to raise money for a local charity. All proceeds were donated to Christmas in the City, a Boston organization that provides holiday gifts to impoverished children. As if that’s not cool enough, in May 2015, Edelman partnered with ProCamps to launch an annual Football Clinic for kids interested in the sport. All proceeds were donated to the Ronald McDonald House of Eastern New England. A year prior, in May 2014, the Patriots star paid a visit to Hasbro Children’s Hospital to help kick-off the Dunkin’ Donuts Iced Coffee Day. During this special event, customers at participating franchise locations can enjoy a medium-sized iced coffee for just 99 cents. Dunkin’ Donuts donates 50 cents of each purchase to the Hasbro Children’s Hospital. Thus far, the annual event has raised more than $650,000. To learn more about Julian Edelman’s philanthropic ventures, click here.